Rhetoric, Politics and Popularity in Pre-Revolutionary England provides an account of the political thought and culture of Elizabethan and early Stuart England. It examines the centrality of humanist rhetoric in the pre-revolutionary educational system and its vital contribution to the political culture of the period. Humanism, Markku Peltonen argues, was crucial to the development of the participatory character of English politics as schoolboys were taught how to speak about taxation and foreign policy, liberty and tyranny. A series of case studies illustrates how pre-revolutionary Englishmen used the rhetorical tools their schoolmasters had taught them in political and parliamentary debates. The common people and the multitude were the orator's chief audience and eloquence was often seen as a popular art. 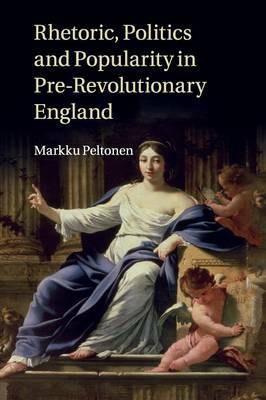 However, there were also those who followed these developments with growing dismay and Peltonen examines further the ways in which populist elements in political rhetoric were questioned in pre-revolutionary England.